Here's what commemorates "Wilfair": a brass hotel drawer pull from The Plaza Hotel in New York City. (Home to "Eloise," of course.) 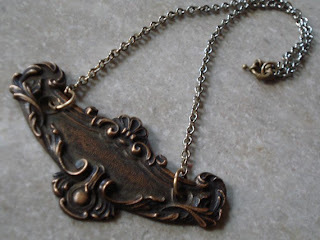 The pull, which likely backed a drawer handle long ago, was fashioned into a necklace by scavengerjo. It's quite unusual, a bit large, a bit heavy, and I love it. I'll post a photo of what I ordered after "Redwoodian"; it summons a particular moment in the book. Maybe next week. And I'm thinking about "Stay Awhile" and what might represent that story best. I have thoughts. This won't give much away if you decide to click here. That is gorgeous! I like that there are items that represent the books so clearly. I never thought I'd be wearing a drawer part around my neck but it works. Again: It's heavy. Brass-heavy. Drawer-fixture heavy. But very pretty. I like your idea of rewarding yourself and that necklace looks gorgeous! Love the thing for Stay Awhile as well, so cute!